It has over 100 clean freshwater dune lakes, spectacular coastal dune formations, sand cliffs and sandy beaches. Tall rainforest grows on the dunes. Birds are the most abundant form of animal life on the island with over 230 species being recorded. It is a particularly important site for migratory wading birds which use the area as a resting place during their long flights between southern Australia and their breeding grounds in Siberia. Few mammal species occur. Dingoes were once common on the island, but are now decreasing. I visited this WHS in December 2017 and I already before going I knew it would have a special place in my memories as it was my 400th visited WHS. To reach Fraser Island you can catch a ferry either from Rainbow Beach or from River Heads. I chose the latter and it was quite a long drive to reach the quaint fishing village of Urangan. The extra time I invested in driving to Urangan in the evening, meant that we could depart later in the morning (if you depart from Rainbow Beach you'll have to catch a much earlier ferry and you'll still have to organize a long and bumpy ride from the ferry point to one of the two resorts on the island (the cheaper one is Eurong Beach Resort; even though, at sunset and sunrise, the 75 Mile Beach area close to the resort is where a number of dingoes can easily be seen - the only ones we saw were here - and it is advisable to keep your distance behind the fenced off area at these times). Fraser Island has no tarmac, asphalt or gravel roads, apart from two small ones within the Kingfisher Bay Resort (where we stayed). Driving is strictly limited to 4WD vehicles and even then, you have to be quite an experienced and skillful 4WD driver to drive from one place to another without getting stuck in the sand which is a frequent sight on the island. Moreover, there is no public transport on the island. With this in mind, I planned ahead before visiting and opted for a 2 day/1 night guided tour with Cool Dingo Tours (and stayed an extra night to revisit Lake McKenzie early in the morning). I'm not usually a fan of group tours, but this turned out to be a very enjoyable one as we were allowed to stray off as long as we were back on time. Another useful tip was to sit at the very front of the 4WD vehicle (less bumpy and more space). We used Urangan as our base to sleep the night before and after the 2 nights we actually slept on Fraser Island. Since we were travelling by rental car from Brisbane, we decided to pay a little extra to be able to park our car at the secure park closest to the Kingfisher Bay Resort Mainland Reception and the ferry departure point. There is also a daily bus service from Brisbane to Hervey Bay (just google Con-X-ion). After spotting some estuarine crocodiles and a short ferry ride to the island, by 10am we arrived at our first stop and highlight of Fraser Island - Lake McKenzie or Boorangoora (photo), one of around 40 perched dune lakes with white silica sands. Fraser Island has in fact half the world's perched dune lakes which is one of the reasons it could demonstrate its OUV for inscription on the WH list. We spent around 2 hours swimming here but around noon, not only was it getting rather crowded but also unbearably hot because of the strong sun rays reflecting on the white sands. On our last day we arranged transport with our hotel (around 7km away) and spent another 3 hours earlier in the morning before the first ferry from River Heads. Food and drink (except water) restrictions apply at Lake McKenzie to avoid attracting dingoes. On our first day, our next stop after Lake McKenzie was Central Station, where there is a UNESCO billboard displaying inscription on the WH list. From there, we did an interesting short hike to Basin Lake perched high in the dunes and then we visited Pile Valley with its towering Satinay trees which can grow up to 40 metres in height. Here I spotted a curious Blue-winged Kookaburra. Next stop was the incredible Wanggoolba Creek, another highlight of the island. It is one of the permanent creeks on the warm, wet valleys of of Fraser Island. These creeks are important refuges for relict ferns, most significant of which are the king ferns which belong to a very primitive family of plants, also found in the Wet Tropics of Queensland. Fossils of similar ferns have also been found at Wanggoolba Creek. What is truly remarkable here is that essentially everything grows on sand! After having dinner at our lodge we were lucky to spot a small eared mountain possu, which was a great way to end our first day on the island. We spent our second day exploring the eastern and northeastern side of the island which is also part of the Great Sandy National Park. Fraser island is the world's largest sand island and it also has one of the world's longest sandy beaches with a zeta curve, which essentially is a fish hook shape created by prevailing ocean currents. Taking off from 75 Mile Beach, we took a 30 minute scenic flight (80$) to enjoy the never-ending beach, sand dunes and creeks from above. The highlights of the scenic flight were Butterfly Creek and seeing the ridiculous amounts of sharks and rays offshore. After reaching Marloo Bay, we visited Waddy Point which is the only place on the island where there is a rocky headland. Here we stopped to swim in the Champagne Pools which reminded me of the rock pools of Porto Moniz in Madeira. Next stop was Indian Head were we climbed up to a magnificent lookout for a panoramic view of the sand dunes and beaches behind us and a panoramic view of the ocean in front of us with endless hues of blue. From here it was easy to spot sea turtles, sharks and manta rays. We were also lucky to be able to see a rare spectacle of strange rainbow formations over the sand dunes. Here I also spotted a pair of White-bellied sea eagles feeding and enjoyed the distinctive aniseed scent from the flowering Wide-bay Boronias. Another two (resting) stops along the long sandy beach were the coloured sands known as The Pinnacles and the Macheno shipwreck. 75 Mile Beach is nicknamed "the ocean highway" as 4WD vehichles use it to drive from one side to the other of the island. The tide comes in and out every day and washes all the tyre marks away constantly changing the beach's surface. The tide comes in quickly in the afternoon so you have to pay extra attention when parking your car if you don't want the tide to "swallow" it. Even though I agree that the number of 4WD vehicles per day should be capped in the near future, I think that erosion is kept to a minimum as visitor numbers 'peak' only during holiday season and still the numbers are not that high considering the huge size of the island. Mats have been placed along the sandy "main road" precisely to help vehicles from getting stuck when the sand gets soft. Dingo fences have been placed around both resorts to prevent scavenging and my impression was that for once, tourists were 'caged' and not the wildlife. Even though there is an environmental impact from tourists visiting the island, I believe that it is being managed well and is a great example of how to strike a balance and avoiding to have yet another unaccessible WHS. The last stop of day 2 was Eli Creek where the final stretch of the creek leading to the ocean is accessible and most tourists (especially families with children) gather at this free natural water park. I borrowed a tube, walked down the boardwalk, and floated down the swiftly flowing creek to the ocean. Luckily, the upper reaches of the creek are protected to aid regeneration and to maintain water quality. On the last day, apart from revisiting Lake McKenzie, we also trekked through the sand to the oasis of Lake Wabby and saw Fraser Island's shifting sands at the Hammerstone Sand Blow, yet another highlight. If you're an experienced 4WD driver, definitely go for it and plan 2-3 days as the bare minimum. Otherwise, you can visit hassle-free with an organised guided tour as we did. Either way, hopefully you'll be able to enjoy one of Australia's top WHS. 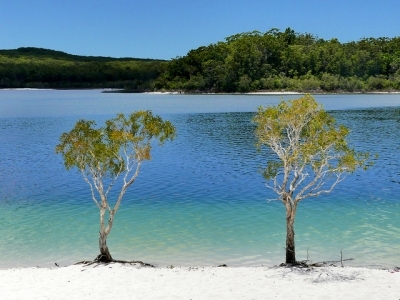 Fraser Island is one of the top attractions of Australia - and rightly so. It is a very special place indeed, and it is hard to describe what makes it so special, but it must have something to do with its being an island and a little remote, with the fact that there are no towns, villages or shops (there is no civilisation besides a few resorts), and also the lack of real roads (there are only some dirt roads/tracks in the sand, and the beach serves as the main road!) ...and of course with the rainforest, the beaches, and the sunshine!!! I visited this WHS in 2007 when I did a trip along the east coast of Australia. It was a guided two day tour and we visited many highlights of the island, such as Lake Wabby, Maheno Shipwreck, Indian Head and Lake McKenzie. We also spent time on the beach and did some great rainforest walks. And although I did a guided tour with a planned time frame, although I was with a big group, although it is a major tourist destination and there are people nearly everywhere you go - I had a great feeling of freedom at this place. The beautiful nature, the sense of remoteness, the sunshine and the perfect surroundings that taste of adventure - it really is like a dream. I have just been to the Island and cannot believe the damage being caused by the visitors to the island. The tracks are being eroded deep into the sand to such an extent that matting is being used in some locations. The East beach is being treated like a Motorway with buses dashing up and down, The beach has litter including broken glass and plastic. I even saw people letting fireworks off and the remains were left on the beach. Unbelievably awesome! That says it all. Best place I have ever visited on this planet, and off too for that matter. Make sure you force yourself to get up way too early and see a Fraser Island Sunrise too, but dont forget to be on the east coast of course. Fraser Island is my favourite place in Oz. It is the world's largest sand island and has magnificent sand dunes, freshwater lakes, rainforest - all next to the grand Pacific Ocean. The champagne pools were glorious for wading, even for the most inexperienced swimmer. Lake McKenzie is an amazingly clear freshwater lake which is also excellent for swimming. As for wildlife, I had the pleasure of seeing wild brumbies on the beach. There were also many dingoes on the island. They were a bit of a nuisance and were especially out and about when they could smell food. 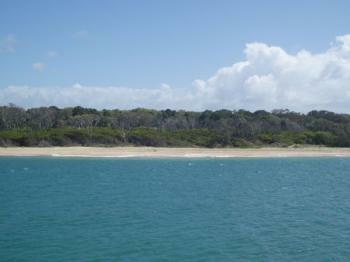 To reach Fraser Island, many backpackers go to Hervey Bay, where they rent a 4WD and take the barge to the island. I was most fortunate to meet 7 other individuals at a hostel in Hervey Bay who shared the expenses of renting a 4WD and food. When you go, be prepared for the possibility of inclement weather, as the cheapest way to stay on the island is by camping. The camp sites are well-maintained. seen alot of oz west and east coast but have to say that frazer was wana of my favourite. 4x4 is the only way to get around the island but it was real fun. The lakes are amazing and you wouldnt believe that the are real. I hate heights but had to go to indian head for the views and it was definately worth it, you can see manta's sharks and whales and you don't even have to pay for it. your ever up by rainbow beach make sure to visit its well worth it. I last visited Fraser Island in 1981, and have been dreaming of going back ever since. That dream is going to come true this year, and I can't wait! I'm very, very happy to discover that it is now a World Heritage Site, as this place is a rare gem which must be preserved! Highlights that remain wonderful memories from the last trip are: Lake McKenzie, Lake Wabby, Lake Birrabeen and the Champagne Pools. A peek at the native wildlife in the evenings was also wonderful. It's a place not to be missed, but please, leave it the way you found it so that future visitors can also enjoy it as much as you did. Faser Island was the most natural unique place on this planet and my family and i had the time of life there. We are already planning another trip there and cant wait!!!! I have been to Fraser Island several times and know I'll go back some day again. It is the most magical place with an atmosphere of purity, freshness and breathtaking, gentle beauty. There are sand dunes, freshwater lakes with sand so fine you can polish your jewellery (if you have any) with it, long white beaches, the purest breed of dingoes in Australia(we saw a whole lot of dingo puppies), crystal creeks and rivers you can drink from while you swim. This is truly Paradise! A truly glorious place. This must be one of the most unique spots on the entire planet. I loved the time I spent there and desparately hope to visit again. If you are in the area, don't hesitate! Go! It's great especially the dingos there soo cute! 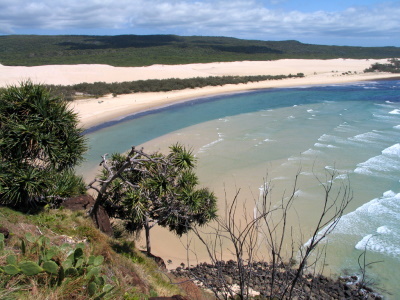 Reduced from broader TWHS: The original nomination included Cooloola, a similar sandy site on the mainland. Inclusion of that part was rejected because of 'land use problems'. It still is on Australia's Tentative List as 'Great Sandy Area'.